A Red Herring from the Green Patriarch? Patriarch Bartholomew of Constantinople and his Synod have issued a special Encyclical for the Sunday of Orthodoxy [Protocol #213] in which he takes vehement issue with those whose opposition to the contemporary phenomenon of syncretist ecumenism is based, he claims, on their opposition to dialogue and to the reunion of Christians. Monday in Saint Gregory Palamas week, the 24th (11th on the Church calendar) of March - and we are celebrating the Memorial Service for the renowned Athonite Elder and confessor, Archimandrite Ioakeim of St. Evthymios Skete in the desert at the end of the peninsula, next to the Cave of St. Neilos the Myrovlite, who reposed on Friday the 21st (8th). I met Father Ioakeim in January 2000 under challenging circumstances. A blizzard had blown up after the small boat carrying me from Daphne to Kavsokalyvia had left port, and instead of disembarking at the Kavsokalyvia port, the boat discharged all passengers at the port of Katounakia, far distant from my intended destination. By the time I had clambored up a sharp ascent from sea level to the top of a rock face along lightly-indented steps cut into the rock, the snowfall was accumulating alarmingly, cutting off the mid-afternoon light and leaving me wondering when - and eventually if - I would find shelter before sundown locked all the gates on Athos. And, although I arrived after sundown, the famous zealot Skete of Saint Basil had left its gate open, and took me in, finding room in an upstairs hall usually occupied by one of the many young novices crowding this small facility in recent years. More than half the monks living on Athos live in the deserts, not in the ruling monasteries, and the vast majority of the desert-dwelling monks will not commemorate the ecumenist Patriarch of Constantinople, a matter which divides the contemporary Athonite community tragically. By morning, the snowfall was a meter deep on average, and the Skete Fathers forbade me to attempt to continue my journey. But by 8 am I had convinced them that the inexorabilities of a fixed-date airline return ticket necessitated my attempting to move on and, promising to return at the first sign of trouble, fortified by toast and jam and raki, and several cups of hot "nes", the updated form of coffee on the Holy Mountain, I set out, arriving at the katholikon of the great Kavsokalyvia settlement on the eve of the Feast of Saint Maximos of Kavsokalyvia, whose intense freedom from attachment to the comforts of this world took the form that gives the settlement its name - he periodically burned down the hut he happened to be living in, with all its contents (they could not have been many, given the austerity of this monk) and moved on. He had lived around these steep, forbidding parts in the 14th century, he was a contemporary of our Saint Gregory of Sinai, and a famous conversation held by these two great hesychasts, recorded by a disciple, forms part of our modern Philokalia. I spent the festal eve with the Fathers of this Skete, well-supplied with a feast prepared for an expected 100 pilgrims, none of whom came given the storm, and slept in a large guest dormitory - also well furnished for the multitudes - by myself. Early the next morning, after the Liturgy and another overly-laden table, I went to a cave once inhabited (and not burnt!) by Saint Maximos, and thence on to the Skete of Saint Evthymios, laden with greetings from a monk in Boston who had lived with Father Ioakeim for some time, and with other greetings and gifts. Father Ioakeim was ill when I arrived but insisted in sitting up in the spartan arkhondariki - the guest reception room - in a very small, dilapidated stone building, in process of rehabilitation by the 4 or 5 young monks and novices who formed his Brotherhood. While reduced to a real minimum of elaboration, the building, its rooms and furnishings were scrupulously clean and the small guest area, accomodating 5 guests in a single, and two bunk beds, was thankfully supplied with a small wood stove to take the damp chill out of the low-ceilinged room in the evening. The first thing one noticed about the Elder was his voice - clearly coming from within and, at the same time, in a most amazing way, coming from a place not within himself - truly a voice from another age. He was entirely calm at all times, and fixed his attention both on the Skete's daily program of activities, and on its guest, and at the same time, on a deeper level, his attention was always clearly somewhere else. It was an entirely wonderful 2 hours' conversation, made more wondrous by his strange gift for making himself understood to someone not fluent in Greek. Father Ioakeim was a strikingly handsome old man, and shows up here and there in the standard photograph books on Athos - twice in a volume called "Athonite Moments" published in German and English, on page 101 (over the caption, "Fromme Gestalt - A Saintly image") and on page 196 (over the caption, "Asketen" - "Ascetics"). The photographs are accurate and show a face dominated by large, ikonic eyes, just as he really was in life, his austere face framed with a great white beard and hair. The photographer saw what truly was to be found in that face, in those eyes - meekness, humility, charity, and the courage that these virtues engender - a face, really, on which is written St. John of Sinai's wonder-working book "The Ladder of Divine Ascent", a face on which is imprinted the Gospel, for which he had ears with which to hear. What the photos do not capture is the transparency of the face and hands. Any who can consult these books will also see, in the photo on page 196, one of his own monks, in fact his eldest monastic son, Father Evthymios, to the far left (the other two are neatly-attired visitors from elsewhere) and it was the vigourous Monk Evthymios who acted as my guide to the immediate region of St. Evthymios Skete, taking me on a hair-raising climb down into the Cave of Saint Neilos the Myrovlite on my first two visits, he skipping like a goat, and me lagging far behind in vertiginous terror at the great height of the place, and the sheer drop into the sea. In discussions of the contemporary crisis in the Church at large and on Athos, Father Ioakeim was dispassionate, never evincing the slightest anger or passion of any kind, but maintaining always a complete and, one could say, saturated peace, reminding me of that peace in the heart spoken of by Saint Seraphim of Sarov. When mention was made of some clear breach of faith on the part of Bishops or Athonites still claiming the name of Orthodoxy while embracing the heresy of ecumenism, he would merely gesture quietly heavenward with his hand and, pointing there, say in the mildest voice, "O Theos" (God), or again, "God will judge". When a currently-famous remark of a well-known Elder, to the effect that the Virgin Mary had advised the man, in a vision, to support the program of the current Ecumenical Patriarch, Father Ioakeim said, again in an entirely uncombative voice but with firmness and with the complete confidence that comes only from an authentically humble heart, "Psemmata" (Lies), as the content of this well-known tale was repeated, clearly not for the first time, in his hearing. It was very odd to hear such a strong word of condemnation spoken with a complete absence of rancour, bitterness or anger: it was not only Father Ioakeim's face that was "ikonic"! Father Ioakeim had a great respect for the founder of the venerable monastery in Boston, Holy Transfiguration - Archimandrite Panteleimon - and spoke of his remarkable achievement in founding a truly Athonite house in the uncongenial environment of the contemporary, paganized culture of the U.S. He was particularly concerned that his admiration and support for Father Panteleimon and his work be realized. I visited again in January of 2001, and last year in July. With each visit, I became more familiar with this small, intense community, some of whom hailed from traditional Orthodox families in villages, and two of whom were the sons of new calendarist families in Thessaloniki. Quiet, self-effacing, given to the hard work days required for survival in the desert of the Athonite peninsula, without self-pity or sentimental expression, an air of quiet, sober joy permeated the place where prayer without ceasing reigned in the hearts of all who dwelt there. When, a few years ago, Father Ioakeim made the demanding trek from his Skete to Great Lavra, from which the Skete is leased, to have his youngest monk written in according to Athonite custom, the Fathers at Great Lavra refused to accept the name, as the policies of the current Ecumenical Patriarch harden against those who will not commemorate the name of an ecumenist Ecumenical Patriarch. Father Ioakeim shrugged peacefully, turned and said to the young monk, "Well, the Panagia will write you in" and they departed, after venerating the relics in the Katholikon. What will now be the fate of these young, dedicated monks of true confession, in the increasingly rigidly-polarized world of the Holy Mountain? Perhaps they will be allowed to continue their lives in this historic Skete. One of the factors motivating commemorating ruling monasteries to allow zealot, non-commemorators to inhabit their sketes, kellia and hesychastiria, is the fact that the zealots take very good care of the ruling monasteries' far-flung properties, rehabilitating them and providing an otherwise economically-unattainable work-force, in the long run, improving the monastery's assets. Another is the fact that even within the ruling monasteries' in-house communities, there is almost everywhere a significant population in overt or covert sympathy with the zealots' position on the matter of syncretist-ecumenism. The cold expulsion of a small house of zealots can have a disproportionally disruptive effect on the home community, and simply not be worth the trouble. But finally, the pressure to expel numbers of zealot Athonite Fathers into mainland Greece may also be restrained by memories of the 1920's, when the expulsion of the first generation of so-called "old calendarists" into Greece merely spread the cause of rejecting the uncalled-for - and already often ecclesiastically-condemned, and deeply-divisive - new calendar across the nation. No government in Athens is openly courting the galvanizing of one of the country's most significant, if also most unreported and unacknowledged fissures, especially in times that daily seem more unsettled, above all for a country in as vulnerable a position geographically, socially, economically and politically - not to mention spiritually - as contemporary Greece. "As God wills", would say the newly-reposed confessor of the faith, and, "God will judge". "Aionia i mnimi tou", we sing in the Memorial Service - "Eternal be his memory". 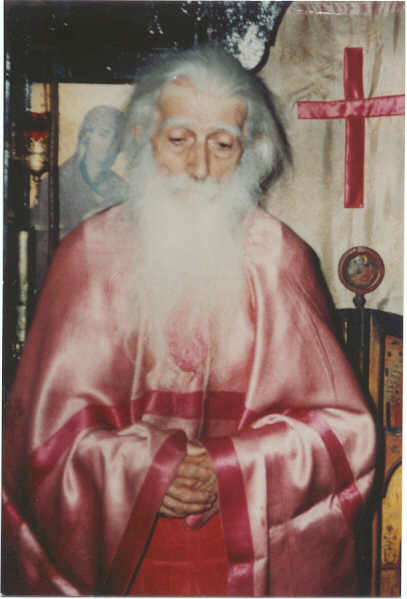 There will be many who, having sung that, will be quickly seeking the intercessions of this dispassionate, confessing monk, this quiet zealot who, already in this earthly life, was a truly heavenly man.